The Presidency of Benigno S. Aquino III began at noon on June 30, 2010, when he became the fifteenth President of the Philippines, succeeding Gloria Macapagal-Arroyo. Aquino is the third-youngest person to be elected president, and the fourth-youngest president after Emilio Aguinaldo, Ramon Magsaysay and Ferdinand Marcos. Aquino is the first president to be a bachelor, being unmarried and having no children. Aquino is the second president not to drink alcoholic beverages; the first president not to drink alcohol was Emilio Aguinaldo. Aquino is the eighth president to be a smoker. Aquino is the first graduate of Ateneo de Manila University to become president. Aquino is the third president who will only hold office in Malacañan Palace, but not be a resident, following Corazon Aquino and Fidel V. Ramos. 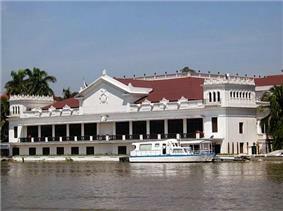 Aquino is the first president to make Bahay Pangarap his official residence. Aquino is the third president to use his second given name, Simeon, as his middle initial, as Manuel L. Quezon and José P. Laurel did. Aquino is the second president to be a child of a former president, his mother was former President Corazon Aquino; the first president to be a child of a former president was President Gloria Macapagal-Arroyo, who is the daughter of former President Diosdado Macapagal. The presidential transition began on June 9, 2010, when the Congress of the Philippines proclaimed Aquino the winner of the 2010 Philippine presidential elections held on May 10, 2010, proclaiming Aquino as the President-elect of the Philippines. The transition was in charge of the new presidential residence, cabinet appointments and cordial meetings between them and the outgoing administration. Traditionally, it is the Chief Justice of the Supreme Court of the Philippines who administers the oath of office to the incoming President and Vice President, however, Aquino refused to allow Chief Justice Renato Corona to swear him into office, due to Aquino's opposition to the midnight appointment of Corona by outgoing President Gloria Macapagal-Arroyo on May 12, 2010, two days after the 2010 elections and a month before Arroyo's term expires. Instead, Aquino formally requested Associate Justice of the Supreme Court of the Philippines Conchita Carpio-Morales, who opposed the midnight appointment of Corona, to swear him into office. Aquino took the oath of office on June 30, 2010, at the Quirino Grandstand in Rizal Park, Manila. The oath of office was administered by Associate Justice Conchita Carpio-Morales, who officially accepted Aquino's request to swear him into office, reminiscent of the decision of his mother, who in 1986, was sworn into the presidency by Associate Justice Claudio Teehankee. After being sworn in as the fifteenth President of the Philippines, succeeding Gloria Macapagal-Arroyo, Aquino delivered his inaugural address. On June 29, 2010, Aquino officially named the members of his Cabinet, with Aquino himself as Secretary of the Interior and Local Government, a position that Vice President-elect Jejomar Binay initially wanted, however, Aquino stated that the post is not being considered for him, but has offered Binay various positions, such as, to head a commission that will investigate the outgoing Arroyo administration, the posts of Secretary of Agrarian Reform, chairman of the Housing and Urban Development Coordinating Council (HUDCC), and the chairman of Metropolitan Manila Development Authority (MMDA), but Binay refused. However, on July 15, 2010, Binay has accepted the offer of Aquino to take charge of the housing sector as chairman of HUDCC. From June 30–July 9, 2010, Aquino was Secretary of the Interior and Local Government, until Aquino named Jesse Robredo, a former Naga mayor, as Interior Secretary. On June 29, 2010, Aquino announced the formation of a truth commission that will investigate various issues including corruption allegations against outgoing President Gloria Macapagal-Arroyo. Aquino named former Chief Justice Hilario Davide, Jr. to head the truth commission. On October 1, 2010, Aquino signed Joseph Estrada on January 17, 2000. On October 2, 2010, Aquino signed Department of Health (DOH) to lead concerned government agencies to facilitate the nationwide Philhealth registration. On November 8, 2010, Aquino signed Department of Environment and Natural Resources (DENR) to the Office of the President. On November 9, 2010, Aquino signed Republic Act No. 8282, otherwise known as the Social Security Act of 1997. On November 15, 2010, Aquino signed Executive Order No. 13, abolishing the Presidential Anti-Graft Commission (PAGC) and transferring its investigative, adjudicatory and recommendatory functions to the Office of the Deputy Executive Secretary for Legal Affairs and the Office of the President. On November 19, 2010, Aquino signed Department of Health (DOH) to the Office of the President. On December 9, 2010, Aquino signed Executive Order No. 18, abolishing agencies under the Office of the President such as the Presidential Anti-Smuggling Group (PASG) and the Office of the Presidential Adviser on Global Warming and Climate Change. On December 20, 2010, Aquino signed Executive Order No. 15, granting combat allowance to uniformed members of the Armed Forces of the Philippines (AFP) who are directly involved in combat operations against members of National Security Threat Groups. On December 21, 2010, Aquino signed SOCCSKSARGEN Area Development Office (ADPO) from January 2010 to December 2016. On December 22, 2010, Aquino signed 1986 People Power Revolution. On December 30, 2010, Aquino signed Executive Order No. 19, extending the suspension of the grant of allowances and other incentives to members of the Board of Directors/Trustees of Government-Owned and Controlled Corporations (GOCCs) and Government Financial Institutions (GFIs). On January 6, 2011, Aquino signed Executive Order No. 20, extending the duration of operation of the Presidential Middle East Preparedness Committee (PMECC), led by Special Envoy Roy Cimatu, to June 30, 2011. On February 1, 2011, Aquino signed Executive Order No. 23, declaring a moratorium on the cutting and harvesting of timber in the natural and residual forests and creating the Anti-Illegal Logging Task Force. On February 10, 2011, Aquino signed Executive Order No. 24, which prescribed rules to govern the compensation of members of the Board of Directors/Trustees in Government-Owned Controlled Corporations (GOCCs) and Government Financial Institutions (GFIs). On February 24, 2011, Aquino signed Executive Order No. 26, declaring the implementation of a National Greening Program (NGP). The NGP will plant some 1.5 billion trees covering about 1.5 million hectares for a period of six years, from 2011 to 2016. On February 28, 2011, Aquino signed Quezon. On March 14, 2011, Aquino signed Executive Order No. 28, reorganizing the Single Negotiating Panel into the Philippine Air Negotiating Panel and the Philippine Air Consultation Panel, mandated by the Philippine government's Domestic and International Civil Aviation Liberalization Policy. On March 14, 2011, Aquino signed Executive Order No. 29, authorizing the Civil Aeronautics Board and the Philippine Air Panels to "pursue more aggressively" the International Civil Aviation Liberalization Policy. On March 14, 2011, Aquino also signed Department of Justice (DOJ). On July 14, 2010, the National Disaster Coordinating Council (NDCC) called an emergency meeting in Camp Aguinaldo to assess the damage caused by Typhoon Basyang. Aquino attended the meeting to obtain information on the damage caused by Typhoon Basyang and to personally monitor the repair and recovery work in the aftermath of the typhoon. In the meeting, Aquino criticized the Philippine Atmospheric, Geophysical and Astronomical Services Administration (PAGASA) for failing to predict and to warn the residents of Metro Manila that Typhoon Basyang would ravage Metropolitan Manila. On August 6, 2010, Aquino announced the removal of Prisco Nilo as administrator of PAGASA. PAGASA was directly under Department of Science and Technology (DOST) Undersecretary for Research and Development (R&D) Graciano Yumul. A special order from DOST Secretary Mario Montejo, dated August 5, 2010, designated Yumul as PAGASA administrator, replacing Nilo. On August 7, 2010, Malacañang announced that Yumul will be heading PAGASA temporarily, for only three months, as PAGASA will undergo a "reorientation" to improve its services. Aquino has yet to name the new administrator who will permanently head PAGASA. During Aquino's first State of the Nation Address (SONA), Aquino announced his intention to reform the education system in the Philippines by shifting to K–12 education, a 12-year basic education cycle. K–12 education is used in the United States, Canada, and Australia. On September 30, 2010, Bishop Nereo Odchimar of Tandag, head of the Catholic Bishops' Conference of the Philippines (CBCP), said that Aquino might face excommunication from the Catholic Church for supporting the Reproductive Health Bill, the plan to distribute and give Filipino couples the choice to use contraceptives for artificial birth control. However, despite the possibility of excommunication, Aquino said that he is not changing his position on contraceptive use. In January 2013, Aquino signed legislation which funds contraceptives for poor individuals; the law has been challenged in the Philippine Supreme Court. On September 22, 2010, Aquino delivered his New York City. On September 23, 2010, Aquino delivered his New York City. On September 26, 2010, during a visit to the Seasons Market Place in San Francisco, California. On September 24, 2010, Aquino delivered his New York City. On September 24, 2010, Aquino had a seven-minute one-on-one talk with President of the United States Barack Obama during the 2nd Association of Southeast Asian Nations (ASEAN)-US Leaders Meeting at the Waldorf-Astoria Hotel in New York City. During the meeting, Aquino recognized the United States’ commitment to reinvigorating its relationship with the region and its individual nations at a time of ever-increasing complexity in global affairs. Obama expressed his determination to elevate RP-US relations to a higher level, and welcomed the Aquino administration’s anti-corruption efforts. Aquino and Obama also discussed military matters, about the possible removal of thousands of tons of war materials that Allied forces had left behind on Corregidor Island during World War II. On October 26, 2010, Aquino met with toast at the State Banquet hosted by Triết at the Government Guest House. On October 27, 2010, Aquino delivered his extemporaneous remarks during a meeting with the Filipino community in Vietnam. On October 28, 2010, Aquino delivered his ASEAN-New Zealand Commemorative Summit in Hanoi, Vietnam. On November 12, 2010, Aquino delivered his Yokohama, Japan. On November 14, 2010, Aquino delivered his Yokohama, Japan. "My smile might have been misunderstood. I have several expressions. I smile when I'm happy, I smile when I'm faced with a very absurd situation...and if I offended certain people, I apologize to them. It's more of an expression maybe of exasperation rather than anything and again, I apologize if I offended certain people, who misunderstood (my) facial expression." On September 3, 2010, Aquino took responsibility for everything that happened during the Manila hostage crisis. Aquino actually has direct supervision of the Philippine National Police, since Aquino had asked Secretary of the Interior and Local Government Jesse Robredo to address other concerns, such as coming up with a comprehensive plan on delivering social services to and relocating informal settlers in coordination with the local governments. Chief Justice Maria Lourdes Aranal Sereno - August 13, 2010 (August 25, 2012 as Chief Justice).